Welcome to another day of Kids Summer Boredom Buster ideas! Today we’re taking a break from mindless fun and going towards a little educational refresher. 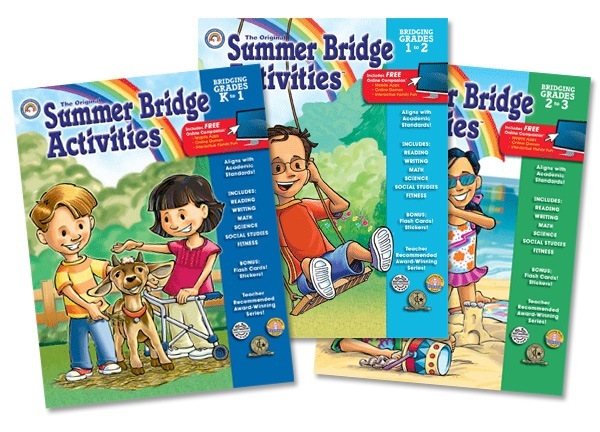 I don’t know what the difference is for my kiddos, but they seem to love the Carson Dellosa Summer Bridge activity books. And since they’re literally ZERO planning on my part, I love them during summer too. Keeping up with your students reading, math, and other basic skills over the long summer break is important. I’m not sure if this happens to your kids, but it seems like a few weeks after school is out my kids seem to forget everything they’ve learned the previous year. Of course Carson-Dellosa also offers a TON of other great resources, and they’ve just made their website even easier to navigate! $5.95 flat rate shipping on all online orders! Wish Lists to create and organize the stuff you want the most! Hope you all have a wonderful summer break! The Summer Bridge books are terrific. They even have a Canadian version (good for those differences in spelling and currency). My ds has really enjoyed them as well. I love Carson Dellosa Summer Bridge books. This is the third year my daughter has done them and the first for my little man. It really keeps them on top of things during the summer and a little ahead even when school starts. This year I did accidentally get the Canadian version for my daughter, and even though we live in the middle of the US, we were still able to use it. I just had the opportunity to explain why some things were spelled differently or the coins weren’t the same. Hi erica! Tanks for all you do. Do you have a daily summer schedule/routine that you follow?